Sheepcote Street Visitor Moorings is a minor waterways place minor waterways place place on the waterways major waterways place village town city on the Birmingham Canal Navigations (Main Line) between Old Turn Junction (¾ furlongs to the east) and Ladywood Junction (Western end of Oozells Street Loop) (1½ furlongs to the west). The nearest place in the direction of Old Turn Junction is Cast Iron Roving Bridge; ½ furlongs away. The nearest place in the direction of Ladywood Junction is Sheepcote Street Bridge (48 hour moorings); ¾ furlongs away. Mooring here is excellent (this is a really good mooring) , mooring rings or bollards are available. Mooring is limited to 2 days. 2 St Philip's Place, , B3 2RB, Birmingham, B3 2RB — 1288 yards to the east. King Edwards Rd, Birmingham, B1 2AA — 144 yards to the northeast. Barclaycard Arena, King Edwards Road, Birmingham, B1 2AA — 155 yards to the northeast. Broad St, Birmingham, B1 2EA — 434 yards to the east. 200 Wharfside St, Birmingham, B1 1PR — 815 yards to the southeast. 81-91 John Bright St, Birmingham, B1 1BL — 1086 yards to the east. Broad Street, Birmingham, B1 2 — 393 yards to the east. 75 King Edwards Road, Birmingham, B1 2NX — 185 yards to the east. broad street, Birmingham, B151 — 373 yards to the southeast. 4 Brindley Pl, Birmingham, B1 2JB — 213 yards to the southeast. The Slug and Lettuce, Waters Edge, Brindley Place, Birmingham, B1 2HL — 273 yards to the east. Birmingham, B1 1 — 902 yards to the east. Victoria Square, Birmingham, B3 3 — 982 yards to the east. King Edwards Road, Birmingham, B1 2AA — 136 yards to the northeast. 3 BRINDLEYPLACE, Birmingham, B1 2JB — 213 yards to the southeast. 959 yards to the east. Birmingham — 1292 yards to the east. 1 Victoria Square, Birmingham, B4 6QS — 959 yards to the east. 2 Brunswick Street, Birmingham, B1 2JF — 245 yards to the east. New St, Birmingham, B2 4 — 1266 yards to the east. Broad Street 5, Birmingham, B12 — 458 yards to the east. 18 Barwick Street, Birmingham, B3 2NT — 1295 yards to the east. Broad Street, Birmingham, B1 2EA — 456 yards to the east. 16-18 Horsefair, Bristol Street, Birmingham, B1 1DB — 1357 yards to the southeast. 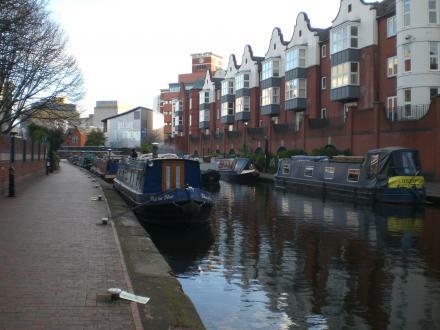 Brindley Place, Birmingham, B2 4 — 135 yards to the east. LEGOLAND Discovery Centre Birmingham, Birmingham, B1 2AA — 66 yards to the northeast. Birmingham, B5 4AH — 1267 yards to the east. 4 Sheepcote Street, Birmingham, B16 8AE — 139 yards to the west. Birmingham — 482 yards to the east. Hurst St, Birmingham, B54 — 1452 yards to the east. Suffolk Street Queensway, Birmingham, B5 4DS — 1166 yards to the east. Centenary Square, Birmingham — 469 yards to the east. Birmingham Museum and Art Gallery, Birmingham, B33 — 921 yards to the east. The Waters Edge, Birmingham, B1 2HL — 161 yards to the east. 1 Brunswick Square, Brindleyplace, Birmingham, B1 2HW — 243 yards to the south. Chamberlain Square, Birmingham, B3 3 — 566 yards to the east. Birmingham — 1555 yards to the southeast. Birmingham — 902 yards to the southeast. Birmingham — 372 yards to the southwest. Birmingham — 288 yards to the east. Eleven Brindley Pl, Birmingham, B1 2JF — 213 yards to the southeast. Broadway Plaza, Birmingham, B16 8 — 762 yards to the southwest. 181 Broad Street, Birmingham, B15 1DA — 549 yards to the south. 220 Ladywood Middleway, Birmingham, B16 8LP — 768 yards to the southwest. 115 Reservoir Road, Birmingham, B16 9 — 1574 yards to the west. 17c pitsford street, Birmingham, B186LJ — 1248 yards to the north. Bullring, Birmingham, B5 4BU — 1603 yards to the east. 1609 yards to the northwest.